Milton Bradley, who had a stormy 12-year major league career with eight different teams, was ordered to begin serving his 32-month prison sentence on Monday, two years after he was convicted for domestic violence. 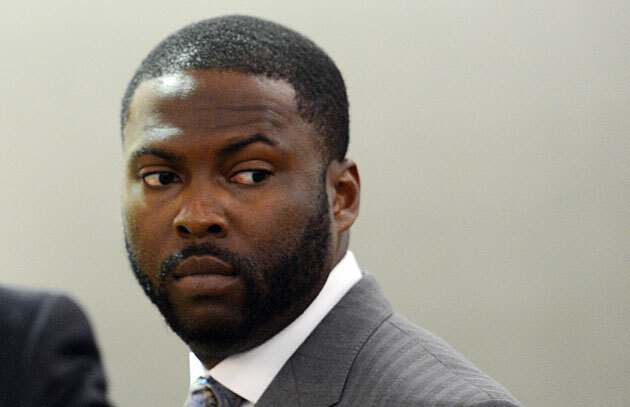 In an emotional hearing inside a Los Angeles courtroom this week, former major league outfielder Milton Bradley was ordered to begin serving the 32-month jail sentence he received following his 2013 conviction on multiple counts of domestic violence and abuse. Los Angeles Superior Court Judge Thomas Rubinson had sentenced the 37-year-old Bradley in June 2013, following a 12-day trial, but until Monday’s hearing Bradley had remained free while unsuccessfully appealing his conviction. Monique Bradley, Milton’s wife of eight years, had been the victim in the case. She died in September 2013 at age 33, just three months after delivering trial testimony that depicted years of physical and deeply penetrating emotional abuse. (Her death certificate stated that she died as a result of cryptogenic—i.e. of unknown origin—cirrhosis of the liver.) Monique Bradley’s testimony was supported by a litany of police visits and arrests over the years, as well as photographs of her injuries, and the testimony of witnesses including the Bradleys’ longtime nanny. After two days of deliberation, a jury convicted Milton Bradley of charges including inflicting corporal injury on a spouse, assault with a deadly weapon (a baseball bat), and criminal threats. A gifted switch-hitter who had played for eight teams during a tumultuous, 12-year career marked by altercations with umpires, teammates, managers, fans and reporters, Bradley had vigorously contested each charge at trial, claiming that the case was a scheme perpetrated by his wife in order to win custody of their two children and squeeze a larger divorce settlement from him. Despite the array of photos and police reports, and in defiance of phone records that listed hundreds of profane, physically threatening text messages the 220-pound athlete had sent to his 115-pound wife over the years, the outfielder and his counsel claimed that his wife had been the abuser in their relationship, not him. The jury didn’t buy it, and neither did Rubinson, who told Bradley at his 2013 sentencing that he had “dehumanized Monique Bradley” and “created and maintained an atmosphere of fear and of dread and of humiliation.” Because Bradley’s crimes were misdemeanors, however, Rubinson was required to let Bradley remain free on $250,000 bond while he completed anger management courses and community service. Rubinson, who called Bradley’s final written request for leniency “breathtaking, frankly, in how callous [it was],” responded to Bradley’s outburst in court: “Well, Mr. Bradley, the fact that you're saying things like that is, to me, not a good sign." At the close of the hearing, Bradley was handcuffed and taken into police custody. The parents of Monique Bradley are expected to seek custody of Bradley’s children. • To view the full transcript of Monday's hearing, see below.